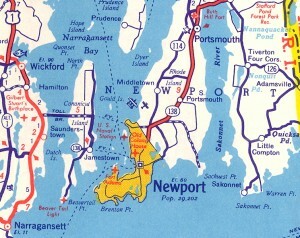 1930s map showing the former location of the airport in Middletown, R.I.
On the morning of August 3, 1937, Everett Johnson Peck Jr., of New York, flew his private airplane from Bridgehamption, Long Island, to Newport Airport, in Middletown, Rhode Island. Mr. Peck arrived at the airport safely. At about noon time, he decided to take off again to view the start of the America’s Cup Race, however he crashed on takeoff and was taken to Newport Hospital with serious injuries. The type of plane was not stated.